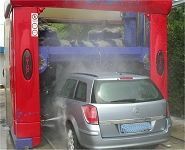 Drive through car wash systems are designed in four main ways for the vehicle wash industry. The type which is most suitable depends purely on your needs. 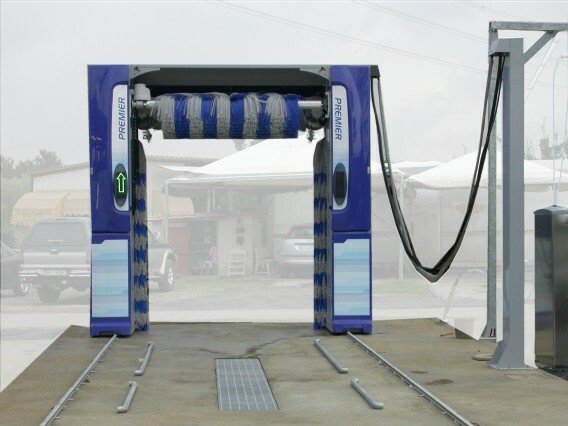 All drive through car wash systems have been designed and built with reliability, versatility, strength and simplicity in mind. 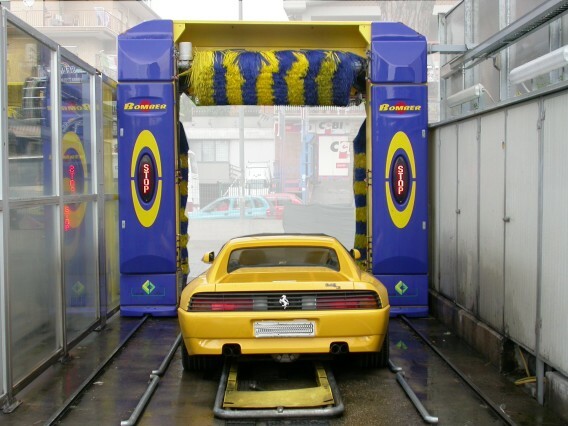 Combined with water reclamation for efficient cost, a drive through system is perfect for cleaning both cars and light commercial vehicles. 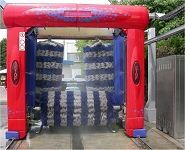 The four car wash systems described below each have a three brush design that combines with pneumatic and hydraulic power for reliability. Galvanised, grey painted corrosion resistant steelwork. Hot galvanised anti-tipping rails that are corrosion resistant and 10 metres long. The fairings are made using ABS. The fairings come complete with blue and grey brushes. The operating buttons can be sited on a pillar or adjacent wall. A PLC control console with programme readers and for trouble shooting purposes. The fairing incorporates a traffic light control. An Inverter control motor system for double dragging. The cabling is all umbilical through the piles. Centering pipes and vehicle alignment. A half automatic winter drainage system. For rinse, both arch and nozzles are used. For both shampoo and wax, arch, nozzles and dosing pump are used. Either 1.5Kw or 2.2Kw water pumps. Pile support for the pipe work and cabling. Up to 2.8m wash height with 12m rail length. 4 levels electronic control Oleodinamic raising horizontal brush. 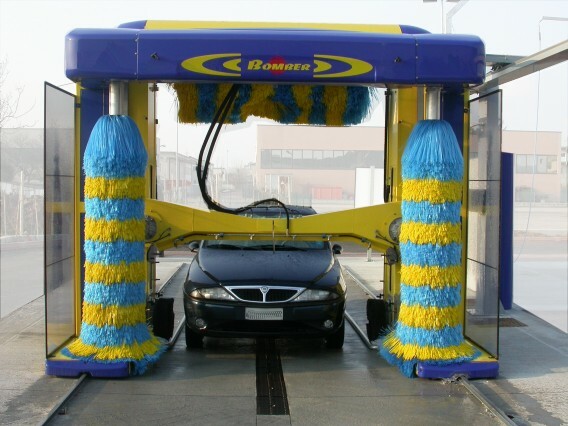 Two vertical brushes are on electro mechanical carriages with double brushing action, again with four levels, controlled electronically. Fitted with a central "to copy", plus two powerful 8Kw fans mounted on an hydraulic lift. Fitted with two side blades, plus two powerful 8Kw fans, again mounted on an hydraulic lift. 4 levels electronic control pneumatically raised horizontal brush. Two vertical brushes are on pneumatic carriages, again with four levels, controlled electronically. Fitted with a central "to copy", plus two powerful 8Kw fans mounted on a pneumatic lift. It has 4 levels electronic control pneumatically raised horizontal brush. 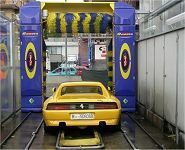 The two vertical brushes are on pneumatic carriages, again with four levels, controlled electronically. Up to 2.7m wash height with 12m rail length. It has a 4 levels electronic control Oleodinamic raising horizontal brush. 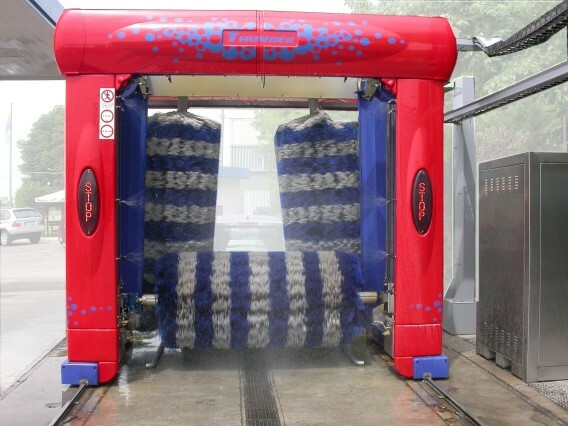 The two vertical brushes are on electro mechanical carriages with double brushing action, again with four levels, controlled electronically. The vehicle position is monitored by photocells. It has emollient dispensing through an arch using a pump and program. Fitted with a central "to copy", plus two powerful 8Kw fans mounted on an Oleodinamic lift. Fitted with two side blades, plus two powerful 12.5Kw fans, again mounted on an Oleodinamic lift. Electrical Ratings: All machines are supplied for 400V, 50Hz power connection, tension tolerance +/-5%. Different electrical ratings are available on request. 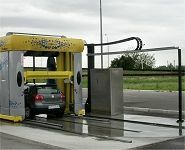 A 3 Brush Wash Car Washers can be used with a water reclaim system which will collect waste water in an interceptor and then recycle. Our team of technicians will be pleased to offer advice, and can design or specify all civil works, interceptors, water reclaim, discharge and drainage. Many models described on this website are bespoke, and as such cannot always be accurately depicted. All photographs and illustrations displayed on this website are representative of model ranges or a model series only. Individual models and specifications may vary from those shown. Please contact us if you require clarification or individual specifications of any equipment. Enviromec reserve the right to update and amend the specification of equipment and accessories without notice and in the interest of the customer. Images or specifications must not be reproduced with express written consent from Enviromec. Any prices quoted are subject to V.A.T. at the standard rate with E&OE.